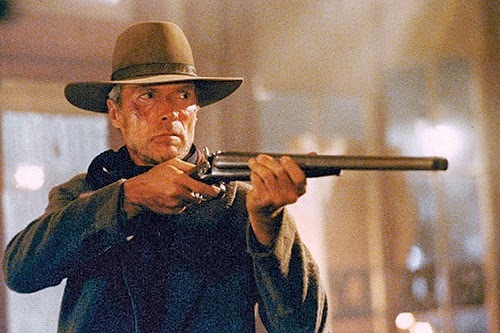 Clint Eastwood once appeared in a movie entitled, "Unforgiven." I vaguely recall that some men had attacked a woman and the rest of the movie is about Clint Eastwood tracking those men down and killing them one by one. This past weekend, the students at the BU Catholic Center were on retreat in Kennebunkport, Maine and as part of the retreat, we reflected on the Gospel of the Good Samaritan. As we were led through a meditation on the Gospel, something struck me about it. No matter what nice thing the Good Samaritan did for the man who was robbed, he didn't undo the robbery. The man was beaten, robbed, and left for dead. If I were writing the screenplay for the Good Samaritan, I think I'd be taking things in a different direction. Namely, after the Good Samaritan cared for the wounded man and brought him to safety, I'd have the Good Samaritan going on the hunt for the robbers. If I were writing this story, there would be a little more Clint Eastwood in the Good Samaritan. Is what the Good Samaritan does for the victim in this story sufficient? He lost his money, lost his sense of security, and was beaten to an ounce of his life. It's all well and good that the Good Samaritan comes along and helps him out, but it seems as though justice has not been done. And, what about that priest and the Levite who passed by and didn't even help the man who was robbed? Imagine laying in a ditch close to death and seeing a priest and a Levite coming down the road. It must have been a great relief. "Surely, this guy will help me," the man must have thought to himself. Seeing two men who were his countrymen and who shared in his religious faith walking down the road must have been like a man on a life raft seeing the rescue plane appear over head. But, this man's relief would turn to a deeper sense of hopelessness as he watched his brothers pass by on the other side. I think I would have the Clint Eastwood Good Samaritan paying those two a visit too. In the Gospel, Jesus tells us that we are to love our enemies and pray for those who persecute us. That's a tall order. While most of us may struggle from time to time with living out various moral teachings of the Gospel, we kind of know that--while difficult--they make sense. "Worship God, Do not steal, Do not kill, Do not commit adultery, Honor your Father and Mother etc," while not always easy, make sense. But, love your enemies and pray for those who persecute you? That does not come naturally. At least for me, and I suspect for a lot of others, by nature we are more inclined to go the Clint Eastwood path. So, why in the world should we love our enemies and pray for those who persecute us? In the Gospel of the Good Samaritan, the man who fell victim was attacked, robbed, and left for dead by the robbers. Additionally, he was ignored and left for dead by his countrymen. So, while it is all well and good that the Good Samaritan comes along and helps him out, isn't that what we'd expect somebody to do? It seems like the Good Samaritan only does what we'd expect a halfway decent human being to act in a similar situation. So, we have one good guy and a lot of bad guys in this story. Ah, but that one "good guy" was a Samaritan. He and the man by the side of the road were enemies. And this is what makes all of the difference. The victim had no expectation that the Samaritan would stop to help him. Similarly, as St. Paul reminds us, "For Christ, while we were still helpless, yet died at the appointed time for the ungodly" (Romans 5:6). While we were laying at the side of the road--helpless--Christ came to our rescue. "But God proves his love for us in that while we were still sinners Christ died for us" (Romans 5:8). We were God's enemies, but he loved us and came to our rescue. Why should we love our enemies? Why should we pray for those who persecute us? Is it because they deserve our prayers and forgiveness? Not really. We should do these things because this is what God does. This is how God has dealt with us. We rightfully expect certain things in justice from some individuals. And, when they rob us or pass us by and leave us for dead, we are wounded by the injustice. But, we can make no such claim upon God. He owes us--who have been enemies to Him--nothing. And yet, this is where his love for us is proven. He loved us and came to our rescue while we were his enemies. To love our enemies and to pray for those who persecute us is to be caught up in something far greater than what our unaided human nature is capable. To love enemies and to pray for persecutors is to be caught up in supernatural charity. The Clint Eastwood model is a natural response. The Good Samaritan model is the supernatural response. Do our enemies deserve our love? Do our persecutors deserve our prayers? No, they really don't. They deserve a visit from Clint Eastwood! But, Jesus doesn't treat us as we deserve. Instead, he comes to the rescue of those who were his enemies. The call to love our enemies is a true challenge. It is a call to the Cross. In the Blood that was poured out upon the Cross, our wounds were healed and we were undeservedly reconciled to God. 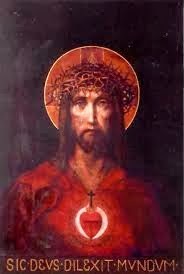 We who have been bathed in the Blood of Christ are really asked to trust Him and to pour ourselves out in mercy towards others. This is an act of total trust. When we forgive our enemies, we set aside our way and trust that God will bring all things to a good end. We have good reason to make this act of trust. St. Paul reminds us, "He who did not spare his own Son, but handed him over for us all, how will he not give us everything else along with him" (Romans 8:32)? To spend each day with witnesses is what I need in my life. Although every Christian is called to be a witness, every Christian also needs witnesses. In my life as a priest, Jesus surrounds me with a cloud of witnesses. I may have more theological knowledge than some of them. I may have more life experience than some of them. But, they are witnesses of Christ to me. This is one of the beautiful gifts of priesthood; to be constantly surrounded by witnesses. I spent the past two days encountering witnesses to Christ. Most of these witnesses are the young people whom I am called to serve. When I see them loving each other as true friends in Christ; when I see them praying the Rosary together, planning a retreat together, going on a Friday night to an evening of prayer or to an evening of Catholic education, spending their Saturday preparing a retreat or serving those with special needs--in these moments, I am educated. This is their witness to me. Sometimes Catholic organizations sound more like they are advertising and less like they're evangelizing. They use language and methods that sound like they were stolen from Dilbert. This approach risks turning the work of evangelization into a merely human endeavor to increase membership, rather than a supernatural initiative to introduce people into Trinitarian Communion. Jesus doesn't need better sales people. He needs witnesses. Evangelization is not about coming up with better and more attractive sales pitches. It is about forming better witnesses. It is about people who have encountered Christ and who have been moved by him. It is about people living the Christian event. Blessed John Paul II was an evangelizer because he witnessed to Christ. Young people heeded his message not because he was a good salesman, but because he was a faithful witness who himself could be moved by the very young people to whom he preached. As a Church, we make a big mistake when we play it safe and adopt the language of corporations. At this moment in the Church's life, we need men and women like Sts. Francis, Dominic, Theresa of Calcutta, and Blessed John Paul II. These witnesses did not play it safe. This morning, I had Mass with the retreat team of BU students who are preparing for next week's retreat. In the first reading, we heard of how Jeroboam set up idols, created his own priesthood, and set up new places of worship. His plan led to his destruction. Too often in our life, we can think that it is our plans and projects that will bring about a successful evangelization. But, this can lead to us being like Jeroboam. Instead of listening to Christ and obeying him, we try to do it on our own. We adopt our own strategies. In contrast, the Gospel today reveals to us where things really begin. They begin in the heart of Christ who is moved with mercy for the people. He knows that they are hungry and does not want them to collapse along the way. He allows his disciples to participate in this act of mercy by allowing them to offer their limited supply of bread and fish. Christ then takes this offering, multiplies it, and feeds the crowd. Evangelization always begins not with us, but with Christ. Then, we are invited to offer our limited gifts and allow Christ to use them for the sake of others. Evangelization is always a surprise. If our strategies do not arise out of a sense of wonder and in obedience to an encounter, then I think it is a good sign that these strategies are not true evangelization. Evangelization makes us wonder, "How is this possible?" Evangelization is always the experience of a few loaves and a few fish feeding four thousand. For me, I look at these young people and wonder, "How is this possible?" How can these young people have so much Faith, be so committed to Christ, be so devoted to the Sacraments, pray so beautifully? When you think of the world in which they live and the secularism that dominates the culture, how is this possible? This is a miracle. Like the people in the Gospel today, I need to be fed. I need to be fed by the mercy of Christ. This mercy reaches me by passing through his witnesses. It is a tenderness and mercy that moves me. and surprises me. Slogans and advertisements will not sustain me for the long journey. In fact, these things can wear us down. I need witnesses. The world needs witnesses to Christ. In a culture where there is so much opposition to the message of the Gospel, it can be tempting to take the path of Jeroboam who attempted to create his own method. But, this is not the right path. The right path is the path of Christ. It is a path that always begins in his heart, passes through witnesses, and provides everything we need to complete the journey. I am grateful that Christ continues to communicate his tenderness toward me through the witness of others. In this way, I am evangelized and am moved to witness this to others. Recently, I was asked what has most surprised me in my life as a priest. I'm not too great at answering questions like that off the cuff, so I asked for some time to think about it. In recent days, I've realized that I'm surprised a lot in my life as a priest. This kind of surprise is not the "cliffhanger" type of surprise, nor is it the type of surprise that unsettles the soul. It is the surprise of an affection that causes a man's heart to leap with a profound joy. It happens in the confessional before a repentant sinner. It happens in the parish when you see your people loving each other and caring for each other. It happens when having lunch with a young person and hearing him speak about how the Lord is working in his life. 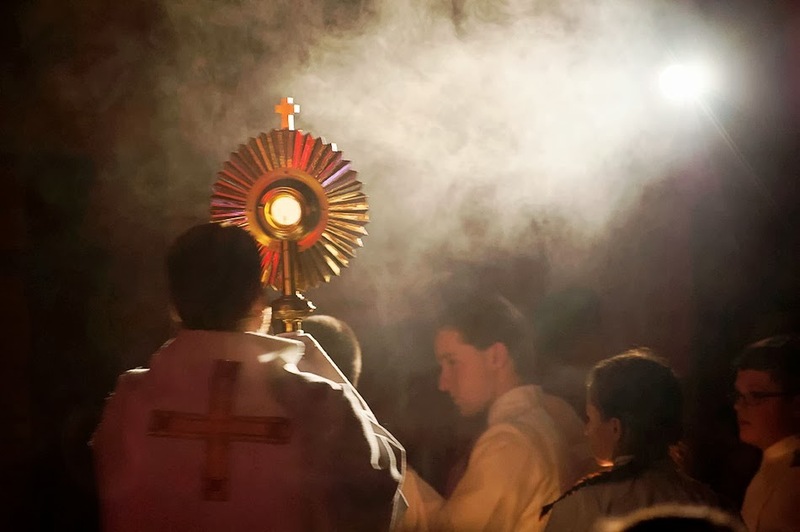 It happened tonight as I sat in chapel and observed two dozen college students adoring the Blessed Sacrament. It happens during the daily encounters I have at our Newman Center. It is an affection that occurs in the pulpit as I preach and look out upon the faces of those to whom I have been sent to preach. It is an affection that stands in wonder of the Lord's work in the lives of his people. It is this affection that most surprises me. It is an affection that makes me feel close to the experience of Peter and Andrew, James and John whose hearts were moved with an affection for Christ. It is an affection that is educative. When I read St. Paul's letters, I do so with a sense of recognition. There lives in my heart an affection for the people that must have also been in his heart. This affection is what belongs to the gift of pastoral charity--the virtue that singularly belongs to the priest. To live priesthood without this affection must be a profound sadness. Without this affection, people become mere customers. Without this affection, the Church must suffer at the hands of clerics seeking advancement, hesitant to preach the Gospel, seeking the approval of the world. Without this affection, there would be no martyrs and no virgins. Instead, the Church would live solely as a bureaucracy or as a pathetic political or ideological structure. Without this affection, the heart would no longer leap with a a joy that is easy and buoyant. Instead, it would drag itself along under the oppression of ideology. This affection brings with it the Cross. When you love the people, you suffer with them. But, in this suffering, one experiences the sweetness of the Cross. Those who live priesthood without this affection--those whose hopes are placed in power and ideology--do not taste the sweetness of the Cross. They too live under a weight, but it is a weight that suffocates. This affection is surprising. It is surprising like young David moving into position against Goliath. It is surprising like the woman who reaches out to touch the tassel of Jesus' cloak. It is surprising like Matthew rising from his table and following Christ. It is an affection that is trustworthy. Without this affection, priesthood and the episcopacy become sheer exercises of worldly power. But, this affection is like the mustard seed. It appears fragile and useless, but it contains within itself an enormous power. 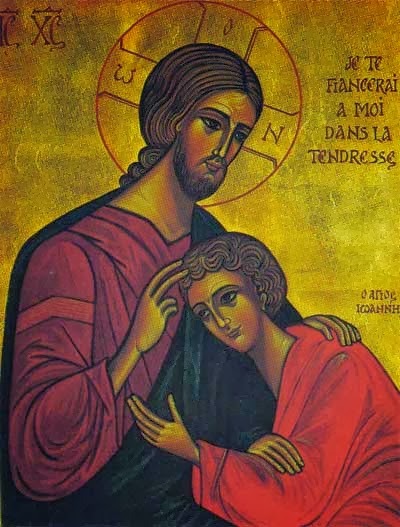 To be given this gift--to look with the eyes of Christ's affection upon the people--this is what has most surprised me as a priest, and it is this affection of Christ that makes me look forward to tomorrow. Sometimes it takes me a while to figure out why something bothers me as much as it does. During the past few years, a certain buzzword has appeared in the Catholic lexicon: "Vibrant." All of a sudden, everything is about being "vibrant." You'd be hard pressed to find a parish bulletin whose "mission statement" doesn't begin with: "St. _____'s is a vibrant community." 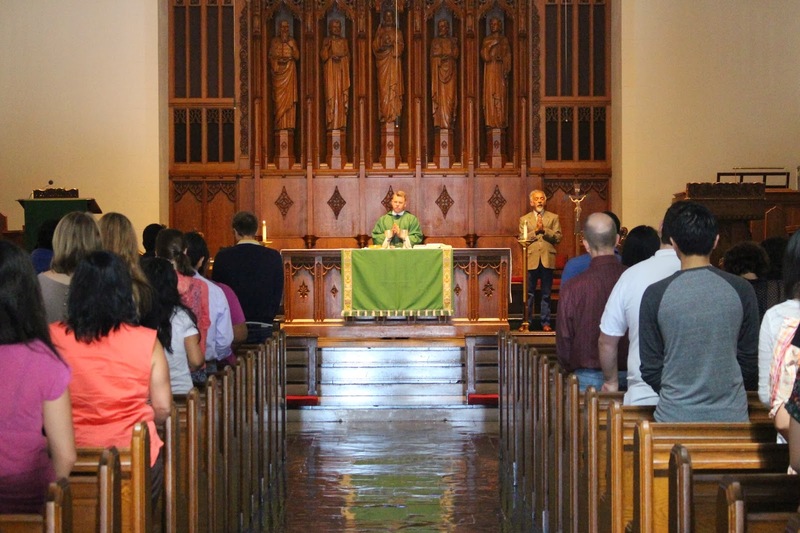 We have vibrant schools, vibrant parishes, vibrant liturgies, and vibrant communities. I sometimes feel like every time the word "vibrant" is spoken, the Church grows a little weaker! But, why does this word annoy me so? Besides simply being overused, the word is often linked with evangelization. And, I think this is what most annoys me. Intentionally or not, this linkage suggests that the goal of evangelization is about building a more "vibrant" parish. In other words, it feels like we are telling others, "Hey, we want you to come join us so that we can call ourselves vibrant." But this feels somewhat sleazy to me. It wreaks of a certain mentality that says, "We want you to join us so that we look better. Our numbers are way down, so we want to reach out to you in order to fix that situation." In other words, it feels like we are evangelizing because we don't want to go out of business. more vibrant. What's really missing in parishes is not greeters at the door. What's really missing is love. Greeters at the door might be a way of loving people and that is great. But, we can have all the greeters in the world, and if they are not shaped by love, then it is all for nought. One of the things that I love about the young people at the Newman Center is their appreciation for the challenges of evangelization and their willingness to meet those challenges. They will say things like, "You know, our goal isn't just to bring people to our Center. The goal is to bring them to Christ." They want to do all of those little things that help to remove obstacles from people hearing the Gospel; things like smiling, introducing themselves, and welcoming others. But, they see all of these little things as an expression of true friendship and not as a marketing tool. In other words, they love the people whom they encounter and this is why they do all of the other things. If I were to offer a course on evangelization, I would not begin with a book on marketing or on building parishes. I'd begin with the Gospel. After all, isn't evangelization supposed to be about the "evangelium?" In the Gospel, we see the closeness of Jesus' friendship with others. He ate with them, walked with them, went fishing with them, and preached to them. They stayed with Jesus not because of his marketing skills, but because of his love. They were moved by this love. Sometimes, when we talk about evangelization, it sounds insincere. It sounds as though we are trying to mimic love in order to create vibrant parishes. But, beautiful parishes and communities grow because the people in those communities are close to one another and they love one another. beautiful thing. But, the reason that they did this was not so that we could be a "vibrant parish." They did this because they wanted to love others. This love is what moved others closer to the life of the parish. We can write in a book that "a vibrant parish has families who cook meals for parishioners who are in trouble," but that can simply become another lifeless committee. Instead, we ought to reflect upon the Gospel and see in those pages how Jesus and his disciples loved one another. This love ought to move us to make similar gestures toward others. won't have to keep doing all of this evangelization stuff! At the Newman Center, I'm grateful that there are opportunities to teach the tools for evangelizing. There are always ways that all of us can learn how to evangelize better. But, these tools can never replace friendship. What's often missing in parishes and dioceses is a joyful love. Do people who encounter us know that we love them? Do they see that we are people who know the love of Jesus Christ and that we are people who love them with the love of Christ? What's missing is friendship. marketing tools. If we want strong parishes and strong dioceses, it has to begin with strong friendships. When people see that we love one another, they are drawn to this friendship--a friendship born from the encounter with Christ. The tools for evangelization are great if they are preceded by a profound love. Let's stop trying so hard to make ourselves appear vibrant. Instead, let's truly love the person in front of us and build the Church one friendship at a time. You know, like Jesus did. When I was first ordained as a priest in the Archdiocese of Boston, things were much different than they are now. Even then, it was clear that things were eroding and that the local church was living in an imaginary world. But, there was still a certain sense of stability. A few years later, with the sexual abuse crisis exploding on the front pages of the newspapers, things began to crumble with lightning speed. Beyond the abuse crisis--which was bad enough--the Archdiocese of Boston suffered a wave of parish closings, sold all of its seminary property except for the seminary building itself, and is now in the process of a new pastoral plan that has created a vast amount of uncertainty and anxiety among its priests and its people. With so much turmoil during the past decade, it can sometimes feel as though the peace of dawn will never arrive.